Campaigns in DSS allow you to create email sequences that are delivered on a schedule or on specific dates. This is a great way to automate your long-term marketing follow up with leads over a period of time, or just generally stay top of mind for prospects! There are many moving parts when it comes to campaign creation, so we’ve broken out the three critical elements of a campaign: Campaign Emails, Campaign Sequence, and Offers/Tags. The Emails are what your prospect will receive, the Sequence defines the method of delivery, and the Offers/Tags determine who will receive the campaign. To create a campaign sequence, you must first create individual campaign emails with the campaign email builder. 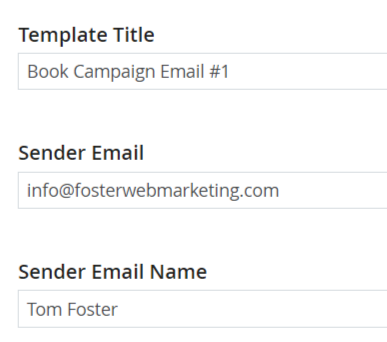 When naming the email template, we highly encourage you to title your emails with the sequence number, so they are easy to identify when you are setting up your campaigns. The Sender Email is the email address associated with your email campaign, and Sender Email Name is who you want these emails to come from. If you specify a “To Email” this email will ONLY be sent to that email address, regardless of who has been tagged to receive the emails in this campaign. This option is great for internal reminders. For example, you may want to have someone on your team receive an email to send a physical copy of your book or follow up with the lead individually. Once you are happy with your Campaign emails, it’s time to set up the campaign itself. To set up the campaign, give it a unique title that clearly relates to the campaign emails. If this is a drip campaign to be sent after someone has requested a free offer on your site, specify which free offer this will be connected to. Use the URL builder to add tracking to all of your emails. This ensures the tracking will be consistent for all of the emails and links in your campaign, and you only need to enter this information once. Next, you’ll have the option to add a tag to your campaign. There are a few ways to assign a campaign. See below for more information. Adding a tag to your campaign will start the campaign for any contacts who also have that tag. To learn more about tags, check out this article. You can assign a contact to a campaign through a tag, or you can automate the process through the “Assign a Campaign” dropdown menu on an offer page. Note: you can assign a campaign within the offer AND add a tag to the campaign itself. If you choose to do this, anyone who fills out the offer form will get any and all tags assigned to the campaign, so you want to be sure there is no crossover if you choose to go this route. Your third option for assigning a campaign is to tag the offer form itself. Go to Campaigns & Emails> Search & Edit Forms, and select the form you want to tag. Add any tags you want those contacts to receive. After you’ve set up your emails, tracking URL, and tags, it’s time to set up your campaign sequences! Give the sequence a name that is helpful to YOU, then select each email and choose the number of days you’d like to delay distribution once someone is added to the campaign. You can also set your emails to send on a specific date, or on the contact’s birthday! Once you have all of your campaign emails scheduled, hit save, and you are done! Be sure to test your campaigns by filling out the offer forms or tagging yourself so you can make sure the campaign works as expected. Need help setting up your campaigns in DSS? Give us a call at 888-886-0939.